Weekly Happenings: This past week was a pretty low-key one. I had a doctor’s appointment where I found out that I have gestational diabetes. I was a little overwhelmed immediately after getting my diagnosis, but Heavenly Father has sent me a lot of comfort and Paul has been a great support as well. I think knowing that it isn’t permanent (since it has to do with the placenta instead of the pancreas, it should go away as soon as she’s born, which is only roughly 2.5 more months) and knowing there’s a way to treat it (with diet and, if needed, medication) has kept me pretty level-headed about the whole thing. Besides, why fuss about something that I can’t change? It is what it is. Tomorrow I will meet with the dietitian who will tell me exactly what type of foods I can eat and how much, will determine if I need insulin or medication, and teach me how to check my blood sugar levels. The only other thing of note that happened this past week happened on Friday. 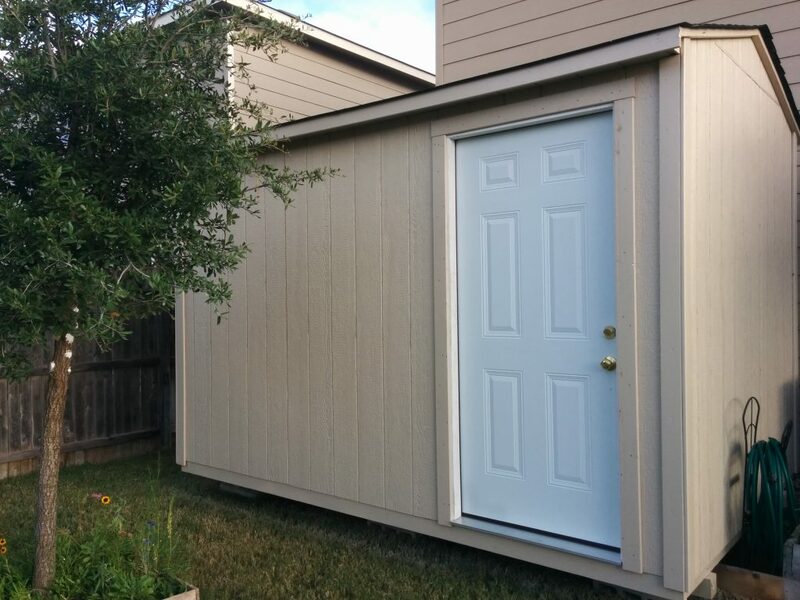 We had some guys come and build a shed in our backyard so that Paul can have a dedicated office space after Abigail arrives (right now his office is in the spare room which will be turned into her room). We still need to have an electrician come out to run electricity to it. 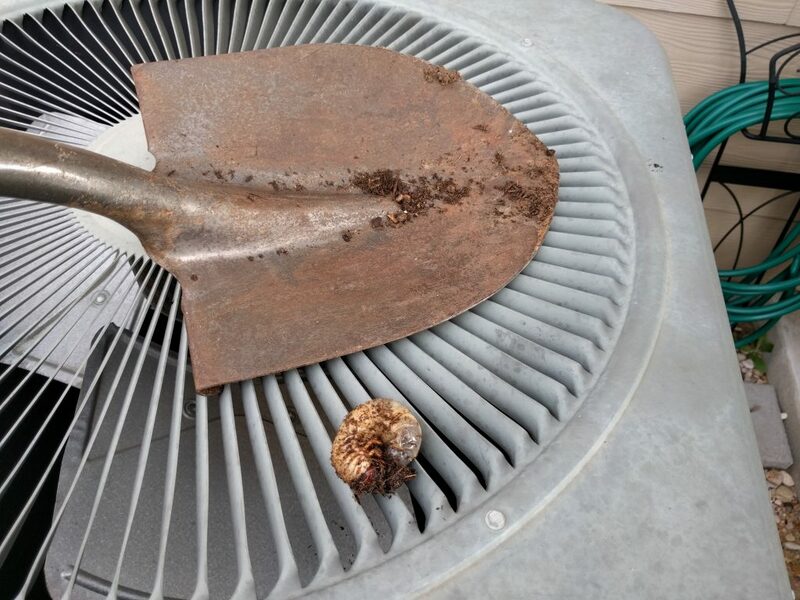 Then Paul will put in a light, cut a hole for and install a window AC, run internet to it, and insulate it. Wahoo! The Weekly Weather: Still warm…still humid…but the mornings have been on the cool side, which is nice. What Paul’s Been Up To: In addition to work, school, and Scouts, Paul tasked himself with clearing the area for the shed to go in. We had previously had a couple of raised garden beds in that exact spot. It was a pretty big job to carefully pull out the plants, move the planters over, and then replant the plants. We’ll see if they take (it might have been too big of a move for them). If not, we can always replant. 🙂 He also had to cap a couple of sprinkler heads and move the drip lines for the plants. One more sprinkler needs to be moved slightly so that the water from it doesn’t hit the shed, but we may just call the guy who installed our sprinklers and have him do it, just to decrease Paul’s workload a bit. What Sarah’s Been Up To: Mainly trying to get a handle on this gestational diabetes thing. Since I knew it would be a week from diagnosis to meeting with the dietitian, I have tried to make little changes, mainly with my diet. I haven’t gone crazy, since I know that I need a plan made specifically for me, but I’ve cut out processed sweets (switching over to fruit in small doses instead), brought my carbs down a bit, and increased my protein. I also eat three smaller meals and have three snacks. Hopefully this is a good start to getting my numbers under control. What Joseph’s Been Up To: He had a lot of fun at school this past week. They’ve been exploring things in nature (they did experiments with both apples and leaves). 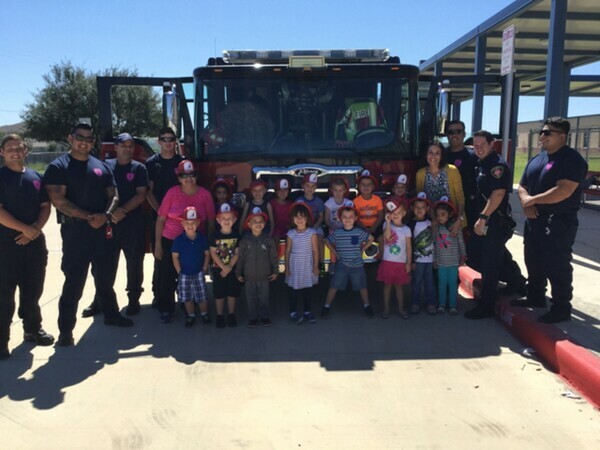 They also had a visit from the local fire fighters who talked to them about fire safety and let the kids check out their truck. We also had his parent-teacher conference. He’s excelling in most areas, especially reading. His teacher told me that there was an instance when she had a coughing fit while reading a story and just had him come up and finish reading the story while she got a drink of water. She’s impressed with the fact that not only can he read the words, but he can read them with expression as well. For the areas where he’s not exactly excelling, he’s right on par with where he ought to be. Good job, buddy! One entertaining story that gives a good glimpse into his funny personality: last night, I had to comfort him when he said he had the “baddest of bad dreams”. He dreamed that all of his candy got thrown away (Friday, he chose to toss a Dum-Dum so he could have some popcorn). Since it was apparently the last one, I promised him I would buy more Dum-Dums on Monday. He looked very relieved and willingly went back to bed. Poor kid! He’s also been fighting a cold on top of allergies. He developed a low-grade fever on Friday, so we spent yesterday at home. No fever this morning, but he’s still going to stay home from church with Paul (who luckily doesn’t have any responsibilities at church today) to get one more day of resting in so that hopefully he will be good to go to school on Monday. 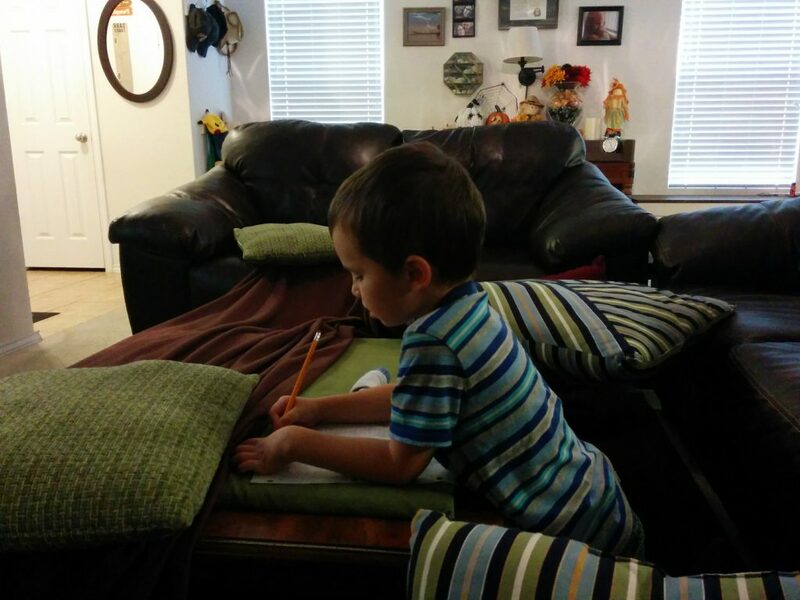 This little boy loves to build pillow forts and then loves to “set up camp” with some paper and a pencil to draw fun pictures. The start to Paul’s office/man cave. I’m impressed with how closely we were able to get the paint to match the house (the guys let us choose the paint chip and then they went and got the paint and painted it). Paul also has plans to put some sort of lattice around the bottom that will still let water drain okay but will keep any critters from moving in…in our area, in addition to the typical critters like raccoons, skunks, and rabbits, we have to worry about snakes taking shelter under there. While most of the snakes are harmless (yellow bellied racers, rat snakes, checkered garter snakes), there is always the risk of the occasional rattle snake. A Party in the Park and Dino Tracks!